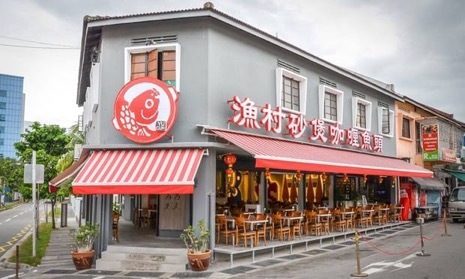 Ah Guan who owns Yu Cun Curry Fish Head started out as an employee from well-known 长城菜饭, before opening his own 菜饭 (mixed vege rice) and 煮炒 (zichar) stalls. With the support and help from his wife and children, this family business is well received by consumers. Yu Cun uses only new and fresh fish heads every morning, while its flavourful curry is by its own head chef. Waiting time for seats could be moderate, reservations are recommended. While waiting for seats, do spend the time to order your food as the food is only prepared upon order. Waiting time for food alone could be 30 minutes or more during dinner time. 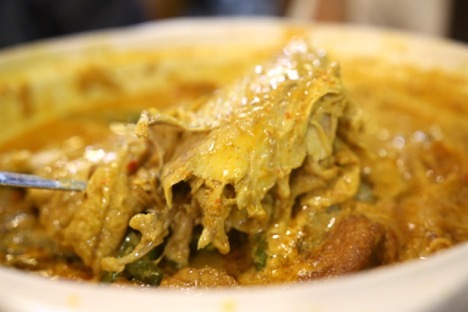 The limelight of the restaurant is the Claypot Curry Fishhead! Every table had a pot of this when we were there! The Claypot Fishhead Curry ($28, Small) contained a huge and fresh fishhead as well as many other vegetables such as egg plants, lady’s fingers, long bean, tao pok, and beancurd skin (you can even order an ala carte fried beancurd skin to be drowned with curry)! 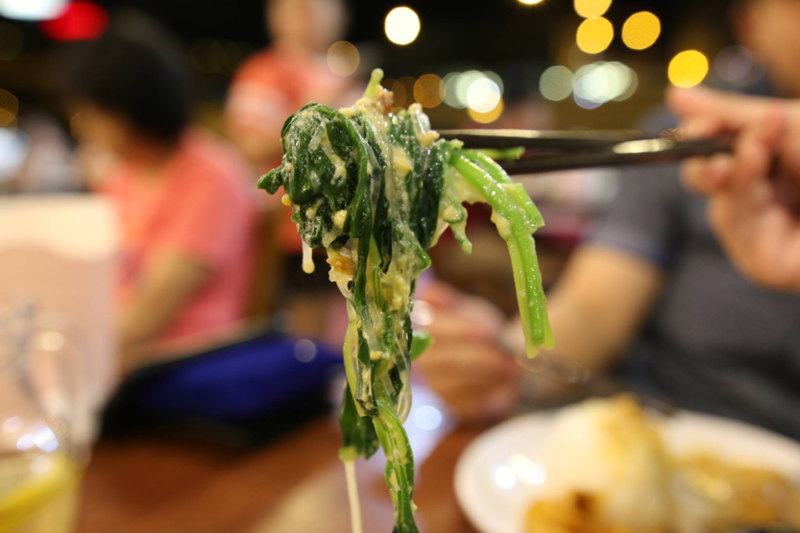 Long beans, egg plants, and tau pok are well-cooked to a really soft texture, that when you bite on it, the curry oozes out easily! Lady’s fingers and beancurd skin on the other hand could be simmered longer as they were not evenly soft and entirely cooked yet. To cut costs, restaurants usually would use curry to cook not-so-fresh fish to cover its stale taste. 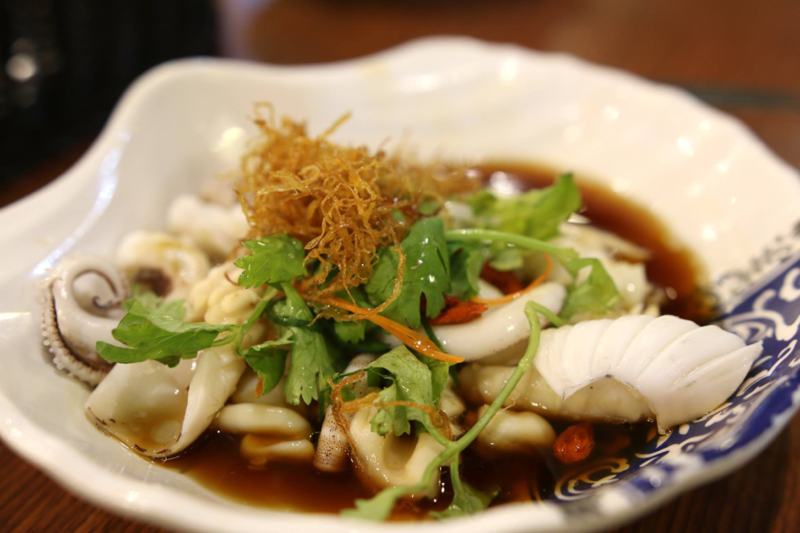 However, Yu Cun lives up to its name when the fish it uses comes off easily from the bone and there is no fishy taste nor stale taste. 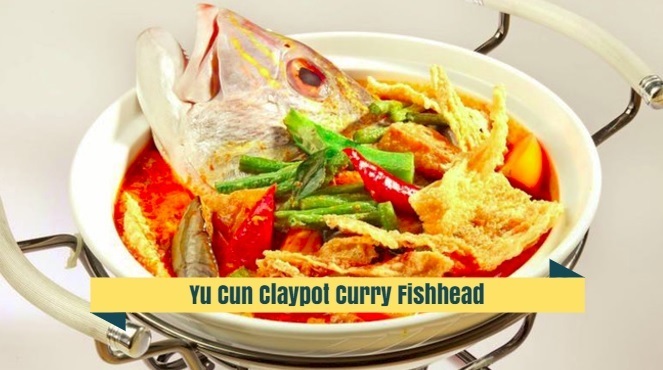 It is strongly encouraged to share this claypot of goodness in groups (3-5 pax) as the fish and vegetables are abundant even in this smallest claypot. Did not have a chance to film the kitchen scene as Yu Cun’s staff were constantly serving customers, so we may come back again at a less peak period! Jazz, however, managed to catch a glimpse of how this dish was prepared. Apparently, the chef would steam the fishhead first, before cooking it with curry in the claypot. Maybe this process explains the long waiting time we waited for this dish to be served. 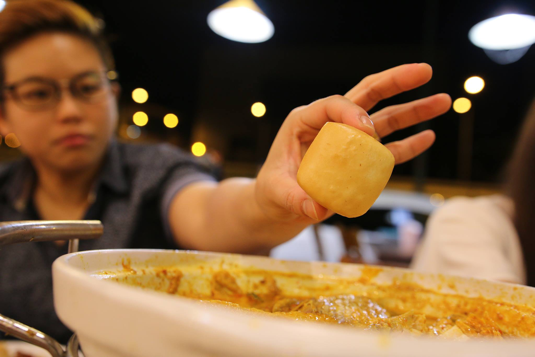 Fried Mantou (Min. 6 pieces) is average even though it absorbs the curry pretty well. 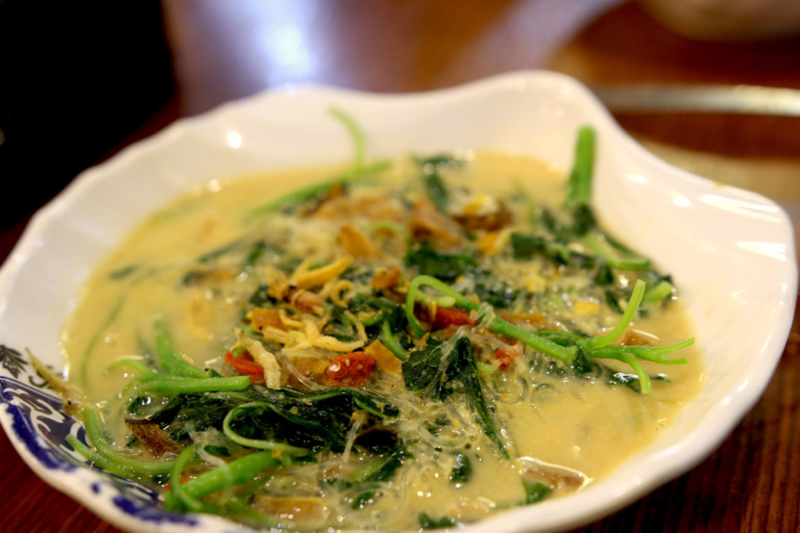 Coriander in Soup ($6.80): Originally thought this dish would be a typical 3-eggs dish. But this was coated with strong salted egg yolk. The addition of Chinese vermicelli surprisingly gave the dish a pleasant and smoother texture! Hong Kong Style Steam Sotong ($12.80) is a simple yet refreshing dish. Soya sauce, chinese parsley and fried onion together with steamed sotong a first time for me. I grew up eating steamed cuisines so this dish does give me the homely feel. However, if you’re looking for strong tastes, you can skip this dish. Rice Wine Chicken ($10.80) make me have mixed feelings. 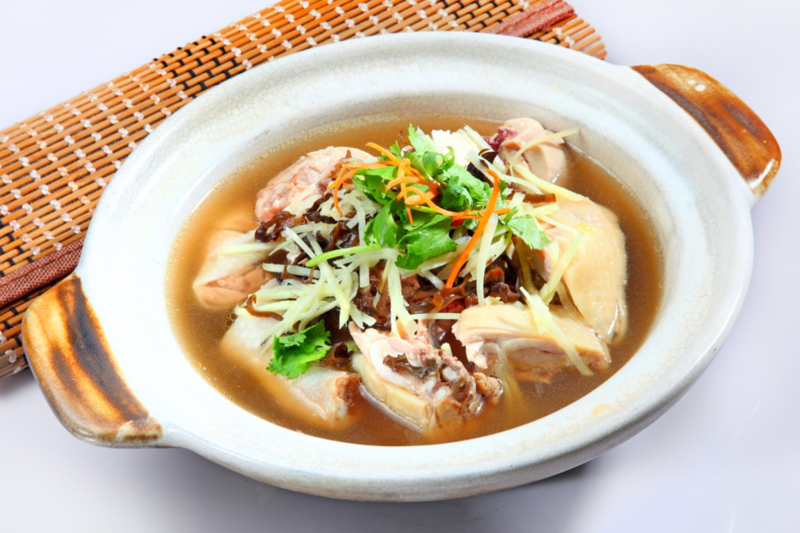 The soup is awesome – really sweet taste that comes naturally with the combination of the chicken and rice wine. 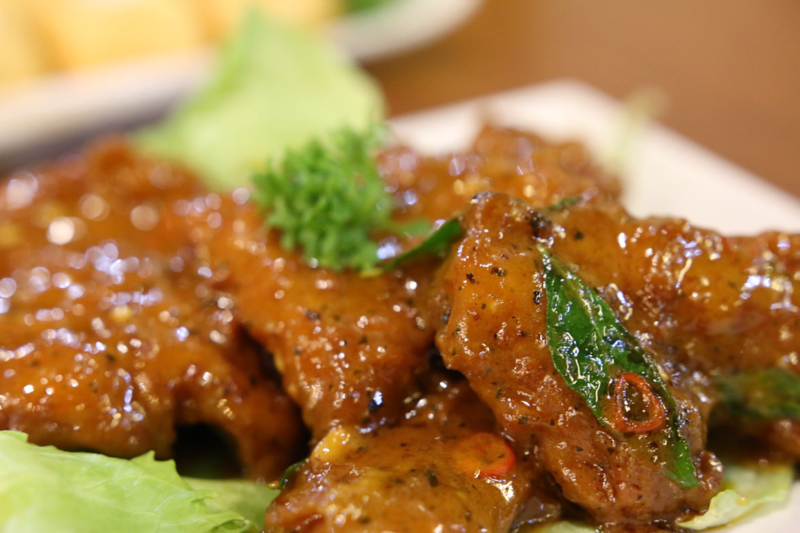 It doesn’t have a strong rice wine taste, yet it sips into the chicken and marinates the chicken altogether. The taste is consistently in every bite. Unfortunately, the chicken was tough and dry. I would love to find out how the soup was made because I believe it will go well with fish too! M O N G O L I A N PORK RIBS ($7.80) is rated the best dish in Yu Cun by all 3 of us. I could eat this alone with just white rice! The flavour on its own were top-notch while the cooking style of these ribs is not easily imitable. This is one of the best pork ribs I’ve ever tasted and I would order this again if I’m back at Yu Cun. Also, I would not hesitate to order other flavours of pork ribs too because the pork ribs on their own are really tender. *DAMN WORTH IT!